A neighborhood park with a play structure and sand pit, community garden, park benches and BBQ pits. A little further up the path at the end, behind some trees, you'll find a great stone bench that has a great view of the area. More information, including plot availability, is located on the Recreation and Parks Department Urban Agriculture website. 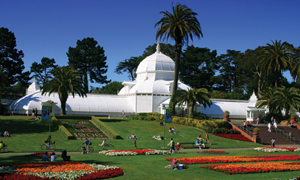 Brooks Park is owned by the San Francisco Recreation and Parks Department. 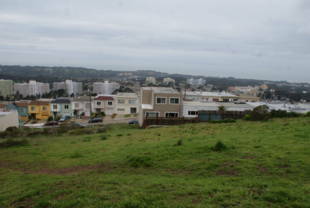 Located on the most southwestern hill in San Francisco, with sweeping views of the Pacific Ocean, the Farrallones and Mt. Tamalpias, Brooks Park was once the playground for Ohlone Indian children during their summer season stay on the shores of nearby Lake Merced. Wildlife roamed the area -- grizzly bears, elk, and foxes -- as well as a wide variety of birds. 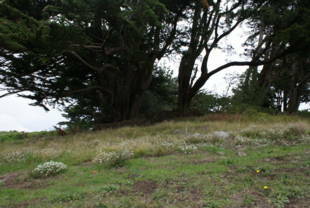 Native plants covered the hills, and were used by the Indians for food, medicine, basket-weaving and fish bait. Many of these plants have survived and are still growing on the park's six-and-a half acres. By 1892, the area from Mount Davidson to Lake Merced was part of the huge Rancho San Miguel, owned by Jose de Jesus Noe (for whom Noe Valley is named). By the 1920s, the land was parceled out to the City & County of San Francisco, and the Brooks family bought a half-acre site on the hilltop. A woman ahead of her time, Mrs. Brooks composted organic materials, kept beehives and taught visitors about native plant gardening. In 1978, when the Brooks family moved to La Honda, the city bought the property. It soon fell into disrepair when vandals torched the Brooks Family house, and turned the park into an area of criminal activity, including drug dealing and pitbull fighting. The Recreation & Park Department didn't promote the park as a family park, residents didn't value it and parents told their children to stay away from it. A member of the Open Space Committee, Lonnie Lawson, obtained funding to install barbecue pits, benches and tables in the park, but on the eve of celebrating the new facilities, vandals trashed them. During the late 1970s and early 80s, two people were murdered in the park, and gun shots were a common sound in the neighborhood. The park was a scene of desecration -- glass shards, used needles, and massive graffiti - and a hangout for hostile teens taking drugs, throwing stones, and yelling threats at anyone who dared to enter. Children said they would 'get jumped' if they went in. In 1987, Peter Vaernet and his neighbors decided that Brooks Park had too much potential to be ignored. They formed Friends of Brooks Park, a block club, and organized work parties to clean up years of neglect. The school district was asked to lock the gates of the elementary school behind the park to prevent entrance and escape routes through the school. Neighbors started a massive anti-graffiti effort, and began removal of the glass shards. They confronted people with antisocial behavior and put out word on the community grapevine that Brooks Park was no longer the place for pit bull fights. License plates of dog fighters were recorded and forwarded to Animal Care & Control for follow-up home visits. The gangs, feeling the pressure, began to fight back. Neighborhood houses were shot at but no one was hit. Slowly those responsible for the problems drifted away - into jail, jobs, school or the cemetery. 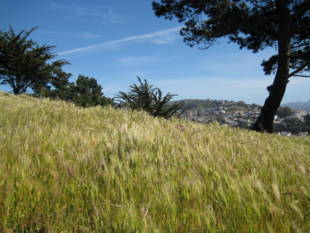 In 1990, the Friends contacted the Open Space Committee requesting a grant to acquire the hillside's surrounding six acres and enlarge the park to its present size. In 1994, the $1,300,000 grant was approved. 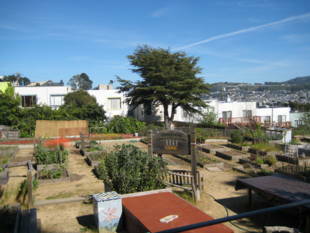 The gated entranceway was built in 1990, funded by the San Francisco League of Urban Gardeners, and improvements are an ongoing process. A community garden is being installed, and native plant restoration and teaching from the Native Plant Society continue at the monthly workdays. Last year the Trust for Public Land gave Friends the Lackmann-Soulages Park and Open Space Stewardship Award. To signal that Brooks is now a Peace Park, safe for women and children, Friends are working with Peaceful Streets to make a sculpture from melted-down hand guns. The park's latest innovation: a free Tai-Chi class on Saturdays, funded by the San Francisco Foundation. Call Oliver Chu at 505-8877 for information. 'Our vision is to make Brooks Park a beacon for community health with community gardens, Tai Chi and native wild life habitats where the next generation can be taught the value of community, neighbors, exercise and nature,' says Peter Vaernet of Friends of Brooks Park. Peter Vaernet - (415) 586-1451, vaernetpeter@yahoo.com"
373 Ramsell at Shields St.